Reading - Continuing with last years 'Reading Rocks' initiative, pupils are expected to read at least three times per week and have their diaries signed by parents. We have well equipped class libraries that have many good 'age appropriate' titles that we encourage our pupils to read. Please ask your class teachers if you are unsure of what to choose and we will direct you to books that would suit your interests and ability. Pupils will receive two Learning Log homeworks each term, related to classwork. MyMaths will be set each week by Maths set teachers. Please store logins for this programme in a safe place – preferably NOT the kitchen table! All pupils have access to SumDog for fun and competitive extra Maths practise. P.E – PE is a compulsory part of the curriculum and we encourage all our pupils to engage fully in lessons in order to develop their physical skills through team games, fitness sessions, dance, gymnastics and swimming. Currently, outdoor PE takes place on a Monday (6CE) and Tuesday (6RP). Pupils should have full kit including trainers for these sessions. Swimming kits need to be in school every Friday for lessons at the Leisure Centre. 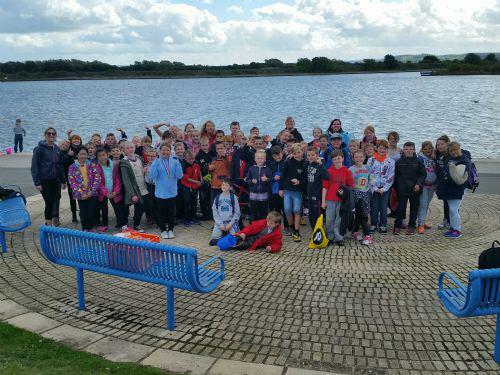 Year 6 are fortunate to be able to choose from two fantastic trips in Year 6. This year we will be heading off to Glan Llyn in February and London in July. Further details to follow. This term we will be studying 'The River Clwyd'. This is largely a geographybased topic and includes classroom study of OS maps to locate the river from source to mouth; learning about the main features of a river system and looking at the impact of flooding on communities and the environment. The topic will also involve a field trip where Year 6 will conduct further studies of the river from its source in the Clocaenog forest, along the 35 mile northbound journey to the mouth of the river in Rhyl. Our class novel this term is 'Boy' by Roald Dahl, which links nicely with autobiographical and biographical work in English.